those who want to relax, benefit from the silence of nature and enjoy the local specialties and especially the excellent wines from the wine cellar of the restaurant. The Petra Segreta Resort & Spa is surrounded by a wild nature, 2 km outside the centre of the charming little village of San Pantaleo. 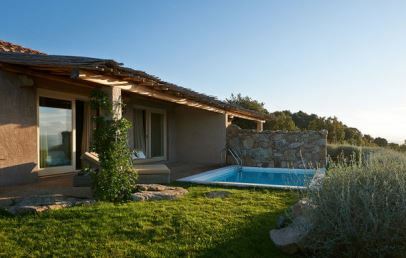 Hidden by giant rocks, olive trees and hills of the Gallura plateau, this small Resort can be really called unique. The closest beach is approx. 10 km away, Porto Cervo around 15 km and Porto Rotondo around 20 km away. To be more flexible and to better reach the locations around the resort, CharmingSardinia.com suggests to rent a car – click HERE to check the TOP prices of Charming. In the main house there is the reception and the restaurant that boasts a beautiful panoramic covered terrace. On the other side of the main house there is the wellness centre, a relaxing area and the pool. The swimming-pool can be heated during the chilly months and has hydro massage jets on various levels. The Petra Segreta Resort & Spa is a Charming House, a place of pure silence ideal for travellers in search of an oasis of peace and harmony, a place where to fulfil the need of a little of “selfish” time to relax and to be pampered with body treatments to gain back the inner balance. All 24 rooms of Petra Segreta Resort & Spa have been built like traditional old farmhouses and have all a warm and welcoming atmosphere. All rooms are equipped with safety-box, air conditioning, satellite and pay TV, minibar, hairdryer, bathroom entirely covered with stone and bathtub and/or shower, bathrobe, slipper, curtsey set, pool-/beach towel and a private equipped terrace. The wellness centre was built and planned with the maximum care to every single detail in order to obtain the best result from all the treatments. Most of the treatments and methods have been studied and organized by an Indian expert of massages and ayurvedic medicine in order to give the pleasure to all the guests to regain physical and interior wellbeing. Following services are offered by the Petra Segreta Resort & Spa: concierge desk, multilingual staff, outdoor pool with jet-massage and therapy waterfall, free parking, free Wi-Fi, fitness corner. Services to pay: excursions, wine tasting, exclusive use of the entire Resort for special events, treatments at the wellness centre. Double room with a welcoming atmosphere like the traditional old farmhouses, furnished with wooden wooden objects that are harmoniously combined with light colours. The bathroom has either a tub or a shower. The private veranda or patio (10 sq.m.) are equipped veranda overlook the greenery. Spacious room with double bed which can be separated upon request. The Junior Suite have a welcoming atmosphere and are furnished with wooden objects that harmoniously are combined with the light coloured fabrics. The bathroom has either a shower or a tub. The outdoor sitting area is equipped with table and chairs and offers garden or sea view. 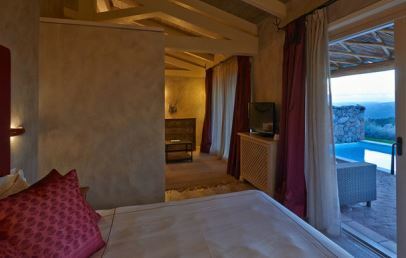 Modern double room, furnished with style with elements of the Sardinian tradition. 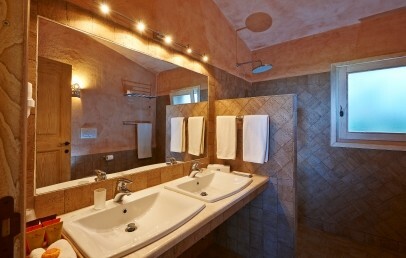 The room is equipped with modern comforts and the bathroom has either a shower or a tub. The rooms overlook the garden. Romantic One Bedroom Suite characterized by the traditional old farmhouses style and the soft light supplied by lamps and abat-jour. The Suite has double bed, large windows facing the terrasse and pool. The outdoor area is equipped with sun loungers and a privat pool with panoramic view.